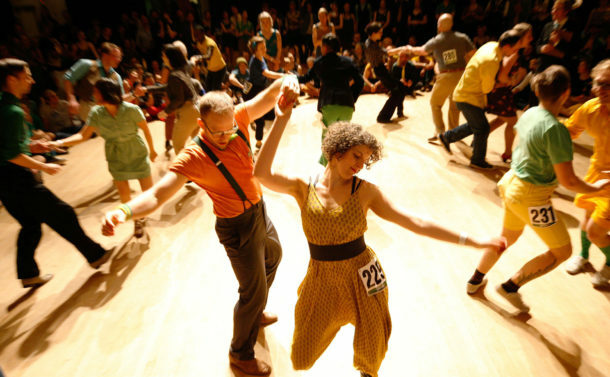 Since 2007, Lindy Bout has been the hallmark swing dance event in Western Canada, and attracts dancers from throughout Western Canada and across North America. Lindy Bout is produced by the British Columbia Vernacular Jazz Dance Society and is a 100% volunteer-run event. Lindy Bout was founded in Vancouver, British Columbia in 2007 to fill a void in the Lindy hop community in Western Canada. It was important to have an event that truly represented where dancers were at in the West, an event that would foster healthy competition, an event that would inspire dancers to keep challenging their dancing, and an event that would bring dancers from all over Canada’s West together for a big party. That’s where Lindy Bout came from and where it’s still going. You can reach us at lindybout@vernacularjazzdancesociety.ca.